Jonathan Howard artist, Jonathan Howard Contemporary paintings, Jonathan Howard figurative paintings, Jonathan Howard mixed media paintings. 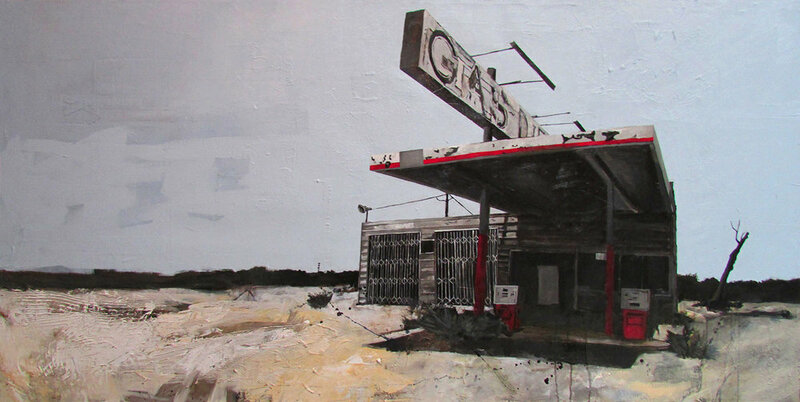 Drawn to urban settings, painter Jonathan Howard creates canvases that compellingly draw from his Surrealist past, his existentialist core and his leanings toward an influence of the Ashcan school. In combination these elements form a wholly contemporary and unique style, one that is objectively presented, allowing the viewer to become part of discovering the meaning of the work. It was, perhaps paradoxically, an isolated background that led the artist to his insightfully broad view. For Jonathan Howard art became a solitary escape as his family moved often: Santa Fe introduced him to the wonders of art, from Native American works to traditional Impressionism and Contemporary art; in Hawaii he fell in love with the artistry of Japanese prints and Chinese paintings. In South Lake Tahoe an artist, taking an interest in him, regularly provided boxes of art magazines which Howard devoured; by reading the articles and studying the work a concrete idea of what it is to be an artist was formed. With a poet mother who supported him completely Jonathan Howard began his own path as an artist, receiving his Bachelor of Fine Arts in Painting from Arizona State University. Shortly after graduating he completed a 400-square-foot mural in the Scottsdale [AZ] Community College Library. The artist has consistently shown in solo and group exhibits since. Jonathan Howard mixes Realism with collaged elements and aspects of Abstract art; he also loves patterns and mixing different moments of time within his work. A palimpsest technique allows words, often in the form of collaged newsprint, to bleed through acrylic surfaces. This half-hidden print can unexpectedly date to the 1700s and hidden collaged burlap can, upon detection, explain a ruggedly rich surface. This technique is a natural outgrowth of the artist’s interest in the layers within urban landscapes. In his surfaces Jonathan Howard evokes the same story as his subjects, encapsulating the endless process of decay, destruction and rebuilding. It is the transient nature of the present that Jonathan Howard so skillfully communicates. “My paintings come to me in dreams, day dreams or random flashes of insight,” he reveals. “I don't concentrate on what a painting is about while working on it. I just work and let it tell me what it's about. I feel that my paintings are the tool my subconscious uses to speak to me, so I just let the dialogue happen and interpret near the end . . . I try to understand myself and the world through the creation of my work."